Getting ready for the weekend: along Sungai Lembing’s main street. Sungai Lembing is a small town that lies in a valley 47km from Kuantan. In the 1900s, the town flourished under the success of the tin-mining industry, with most of its development credited to the British-run Pahang Consolidated Company Limited (PCCL) that took control of the mines in 1906. The company provided the area with free electricity, water, housing and education, making it self-sufficient and a popular choice for work. “At the time, Sungai Lembing was [more developed] than Kuantan. There was a hospital, electric power station, cinema, clubs, several schools… there was duty-free and we could even find British products here. The place was very clean,” remarks the owner of Panorama Café, Lee. He runs the Malay warung with his wife along Sungai Lembing’s only main road. A tour of the mines provides more backstory: in 1888, the Sultan of Pahang granted an initial 80-year mining concession to Pahang Corporation, which later became PCCL and subsequently the Pahang Investment Public Limited Company (PIPLC). Sungai Lembing has the largest network of underground mines (a combined length of 322km2), and in 1986, an illegal mining scandal shook Sungai Lembing after the mine’s closure. Lee’s warung Panorama Café in the early evening. The falling tin prices and collapse of the tin mining industry had an unfortunate effect on the town’s economy. Lee’s father used to work in the tin mines until the company’s closure forced him and many others to retire, and in 2005 – after another company’s failed attempt to revitalise the industry – the government reclaimed the area. “When the mines shut, everything else closed too. There were no jobs and most people left Sungai Lembing to find work,” Lee explains. He had also moved around the country for work, eventually settling in Johor Bahru for 12 years. Upon returning to Sungai Lembing almost 15 years ago, Lee opened Panorama Café. He occasionally emcees at weddings and events to supplement his income, and used to organise homestays between tourists and local families around Sungai Lembing. “I think it was six to seven years ago that more people started coming to Sungai Lembing,” Lee recalls. “While people previously used to come to find work, now they come for tourism,” he says, referring to the natural attractions of Rainbow Falls, Panorama Hill, and Gunung Tapis, which draw city-folk as far as Singapore looking for a weekend escape. 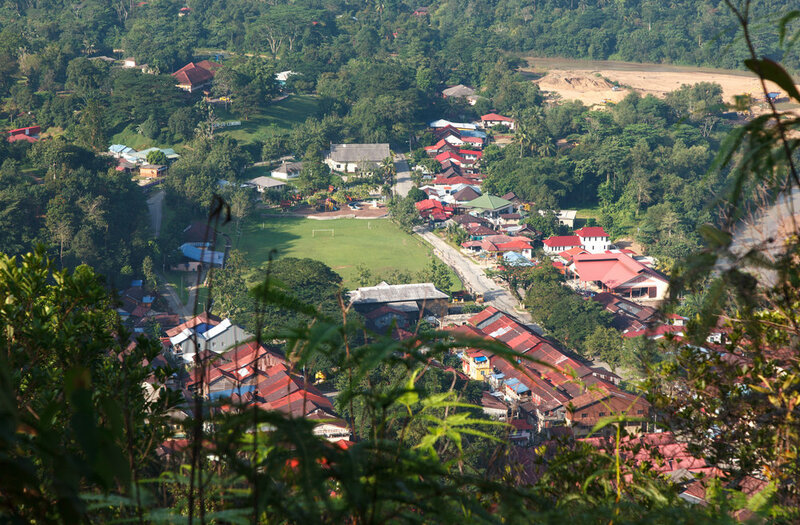 Sungai Lembing captured from the stairs of Panorama Hill. On weekends, Sungai Lembing’s main square is packed with cars and people; modified Toyota Hilux cars ferry tourists to Rainbow Falls, known for its recurring rainbow at the base of the waterfall – an Instagram-ready phenomenon. The 30-to-45-minute climb up the steps of Panorama Hill becomes a long queue to the peak to watch a beautiful sunrise. It’s up here that you can get a panoramic view of Sungai Lembing; the sea of clouds above the town, the mist rising between the mountains. Besides its natural attractions, cycling, jungle trekking and fishing are popular recreational activities, and with most of its buildings and structures unchanged, an exploration of the town also gives you a sense of Sungai Lembing’s past. Sungai Lembing on a Thursday afternoon. On weekdays however, Sungai Lembing reverts to being a sleepy town. Most shops don’t open until the weekend or are permanently shut; the market operates limited hours, and since the end of the tin mining industry, the population of Sungai Lembing has dwindled from an estimated 9,000 residents to approximately 1,000. The residents of Sungai Lembing are either elderly or very young, “Parents leave their kids here for the grandparents to look after while they earn money in the city,” Farah, who works at Green Peace Guesthouse, explains. The beautiful and safe environment of Sungai Lembing makes it an easy choice for parents. The hanging bridge at Kampung Kolong Pahat, constructed over a century ago. Since the town’s ecotourism boom, a majority of the businesses in operation today are hotels and hostels that have mushroomed, but according to Lee’s brother Amie, it’s difficult to make a living outside of the industry. He himself resides in Kuantan for an advertising job. “I don’t know how much longer [the town] will be like this,” Amie wonders. He believes there should be more support for young people to set up sustainable businesses that will grow the local economy. Pasar Sungai Lembing on a Friday afternoon. The town livens up as the weekend crowd roll in. But even with the town’s uncertain future, the locals continue to support each other any way they can. It’s this sense of community that Amie loves about his kampung. 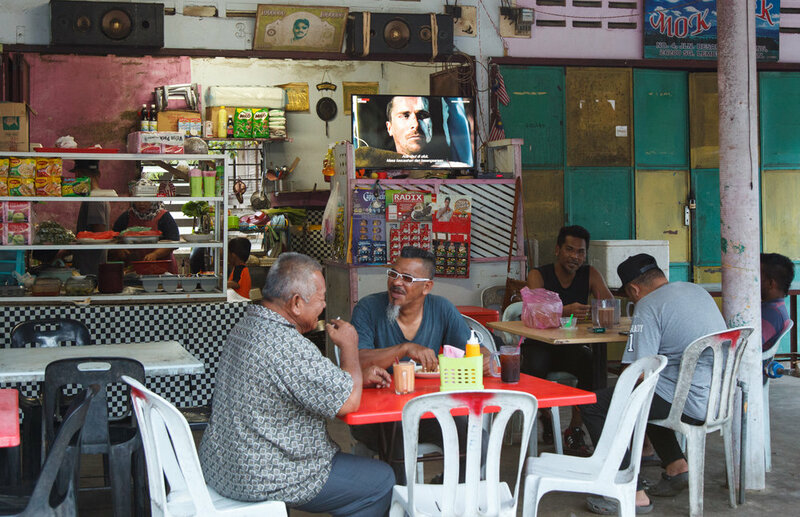 For the time being, Sungai Lembing continues to bustle on the weekends, bringing life to an otherwise quiet town.